“First Watergate Barge Concert,” Histories of the National Mall, accessed April 23, 2019, http://mallhistory.org/items/show/187. At sunset on July 14, 1935, Dr. Hans Kindler conducted the National Symphony Orchestra in the first performance at the Watergate steps near the Lincoln Memorial. The orchestra played from a specially contracted barge anchored in the Potomac near the steps. Tickets ranged from 25 cents to a dollar, although people listened for free from nearby boats and the Arlington Bridge. The first concert included pieces by Wagner and Johann Strauss and the Tchaikovsky's 1812 Overture. President Franklin Roosevelt dropped in to listen shortly before intermission. 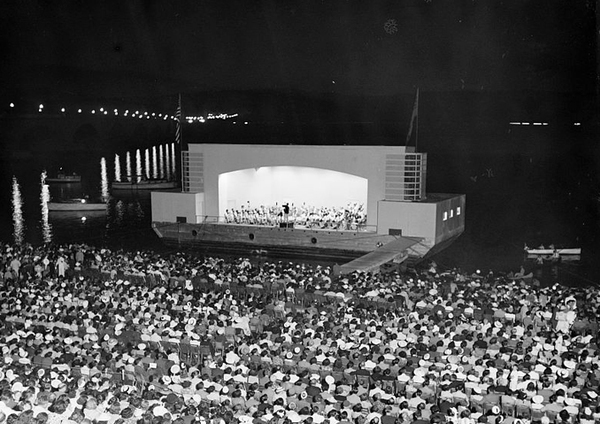 Watergate concerts continued until the 1960s.